Nimtho lights up the dark residential lanes of Pamposh Enclave on quiet nights—its presence commands attention, albeit unostentatiously. The enclosed first floor and charming terrace rest sturdily atop a Sikkimese organic store. 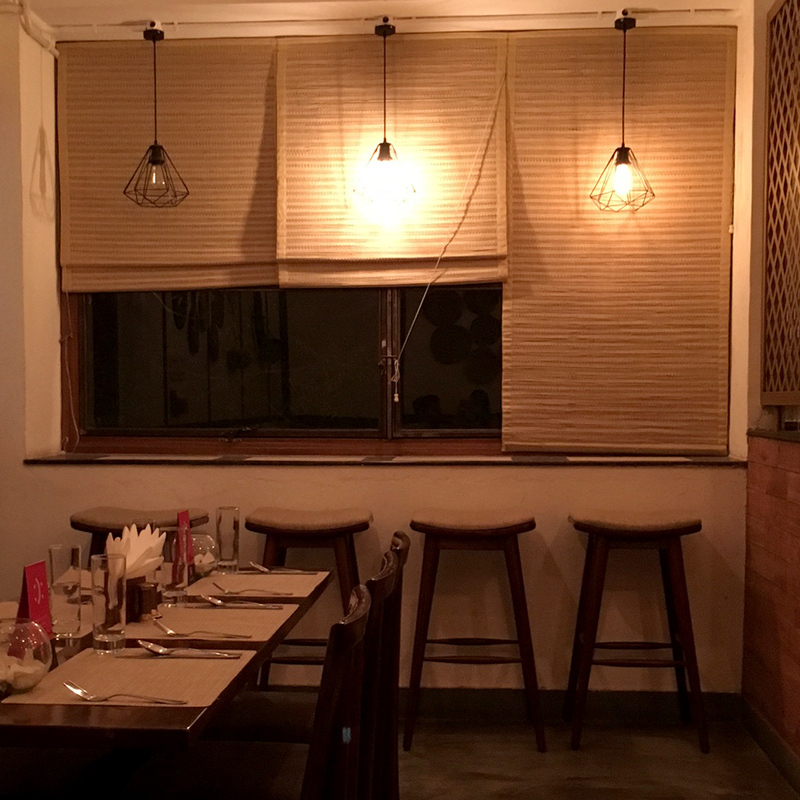 Carrying forward the Sikkim theme, Nimtho has an extensive menu and some of the most courteous staff you're likely to find in Delhi. Dim lighting gives the place a peaceful air and the wicker furniture contributes to its overall light vibe. The servers were happy to help decide on food choices, and on their recommendation, we started with a churpi ko raas (cottage cheese soup). It was a light, mildly spicy broth with cottage cheese crumbled into it for weight. We made notes about this healthier and more novel alternative to croutons, and would easily return for this soup alone. Our meal transitioned into solids with a portion of buckwheat momos. The buckwheat covering felt stones lighter than the usual flour. They held together well, among our fingers, not self-destructing at the pull of our teeth. All accompanying sauces, except the bright orange ginger-flavoured one, were extremely spicy. The next starter, tareko pork, arrived looking like double-fried bacon. It was exactly that—thick slices of pork fat coated in a very light batter and cooked in its own juices. Although heavy, this is more a "taste" dish than something otherwise substantial; we'd recommend eating it as a side with a soup or, if ever Nimtho decide on serving alcohol, a drink. A Sikkimese thali was portioned well enough to be shared between two without any compromise. It worked as the ideal main, in terms of both variety and fill-factor. A wholesome soup with veggies and beans was like Sikkimese chili. A gundruk preparation was as compatible with the chicken curry as the rice: the soft strings of gundruk came with the rich, pleasant taste of ghee; it felt comforting, almost Ayurvedic. Multiple pickles added more zing to the meal. We could've stayed longer just for Nimtho's warm and calm energy after such a fabulous meal. Lingering over conversation, we finally decided to make the effort to move from our seats and take a walk instead. We'll be back for another lovely meal (on the terrace next time) when the weather is less extreme.